Y WORK AT CAMP WATCHAUG? Working at camp is a REAL job in which you will learn life skills that all employers will want to see on your resume, no matter what your future career plans are! Communication. You will be required to communicate effectively with your campers, co-workers, supervisors and parents. Critical Thinking and Problem Solving. 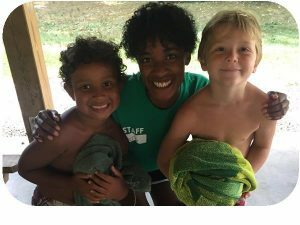 You will be challenged to think on your feet to resolve a myriad of issues from the health of your campers to how to get them all into the water for swim lessons. Interpersonal & Leadership Skills. You will model professionalism and compassion by managing a group of campers, while contributing to the growth and development of each one. Collaborative Skills. You will receive on-the-ground, practical, real life training and experience in how to work with a team and help build the positive culture of our camp community. Creativity. You will develop innovative and fun ways to engage an audience of two to 200 and implement alternate plans when faced with unexpected changes to the daily schedule. All Camp Watchaug staff are required to complete a criminal background check, appropriate employment application and forms, three reference checks, and 30 hours of staff training prior to the start of summer. Questions regarding how to have the BEST.SUMMER.EVER? Email or call Danita Ballantyne, Camp Director at 401-364-6535.